The ABC on Sauchiehall Street in the West End of Glasgow was once home to the first cinema ever to open in Scotland back in 1896. It has had many names over the years - The Hippodrome, The Ice Palace, Hengler�s Circus and ultimately ABC - but since its conversion in June 2005, it has become a live concert venue, and has rapidly turned into one of the favourite live music and club venues for the whole of Scotland. 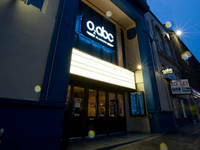 There are two rooms at the O2 ABC � ABC1, with space for an audience of 1,250 and ABC2 which is a more intimate setting that can hold 350. All manner of household names on the local and international concert trail have played at the O2 ABC since its opening, and there is also a regular Friday night club, Festival, hosted by the resident DJ. On Saturdays, it time for the Love Music club in ABC1. The Polar Bar is on the second floor of the building and it welcomes different DJs on Thursday, Friday and Saturday nights. If you need accommodation near O2 ABC, look no further than The Sandyford Hotel on Sauchiehall Street, just a short walk from this concert venue which is located on the very same street. The high standard of accommodation at the hotel comes at affordable rates. Our B&B prices are cheap and include a full Scottish breakfast. The 55 well-appointed rooms are available all year round for visitors travelling to Glasgow. To check on room availability for your dates, call The Sandyford Hotel now on (+44) 0141 334 0000. Our helpful staff will be delighted to advise you about the different hotel rooms available and recommend this particular Glasgow hotel as the best solution for your bed and breakfast needs when looking for O2 ABC accommodation. Alternatively you can fill out the booking form on this website and make your reservation immediately.